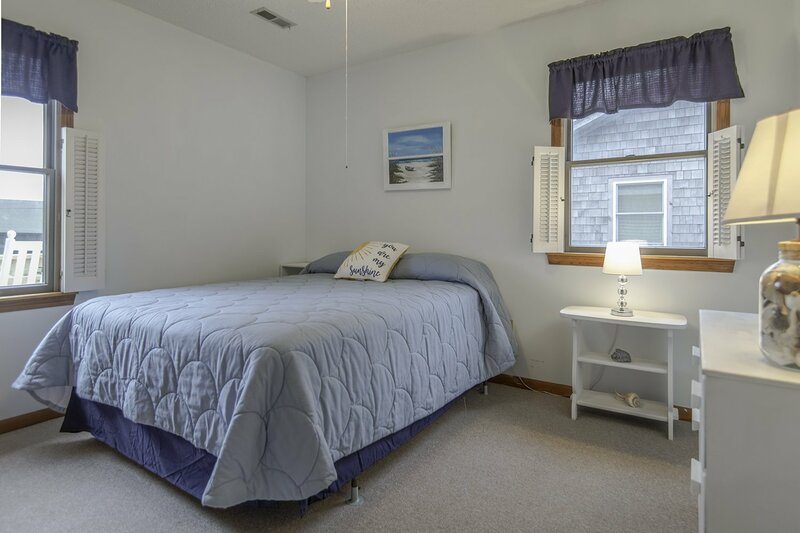 "Carolyn's Cottage" is a comfortably furnished beach home located in the heart of Nags Head & is a great choice for your family get-a-away to the OBX. Constructed w/ the traditional H-floor plan w/ two bedrooms & each side that share a hall bath & the Living/Dining/Kitchen area in between, this home is nicely decorated & well equipped. There are two sun decks, a covered porch & a large sitting area beneath the cottage w/ furniture & picnic table, a wonderful place to relax & spend time w/ friends. Situated within easy walking distance of the beach (approximately 425 feet to beach access) & only one lot back from the ocean. Ground Level: Parking for 4 Cars, Steps to Covered Entry, Utility Room w/Laundry Area & Full Size Refrigerator, Half Bath, Covered Area w/Picnic Table, Charcoal Grill, & Enclosed Outside Shower. Main Level: Living/Dining/Kitchen Combo Area, 32 Inch TV, Stereo, 4 Bedrooms (3 w/Queens, 1 w/2 Singles), 2 Full Baths w/Tubs, & Access to Covered Deck w/Deck Furniture & Sun Deck. Features include: C/AC & Heat, Washer/Dryer, Dishwasher, Microwave, TV, Wireless Internet, & Deck Furniture. Two Dogs Allowed w/Fees. This is a Non-Smoking Unit.